Super consistent Bernadini gelding Frankiedee broke through for a well deserved maiden victory at the Geelong Synthetic over 1300, on July 3. After racking up 3 placings on the trot from his only 3 starts this preparation, he proved too good for his rivals in a strong performance. Leading jockey Jamie Mott put him into the race from his wide draw and this proved to be a significant factor in his victory. After being 3 wide early down the back straight he pressed on to get outside the leader for the latter part of the race. At the 400m he made his move and quickly ranged up to Sequin Assassin, as they straightened. The leader still had a kick and again gained the upper hand in the early part of the straight. Not to be outdone, Frankiedee rallied and again drew level with 200m to go. His finishing effort over the last 200 of the race proved far too good for the rest of the field and underlined his potential to race well over longer distances. 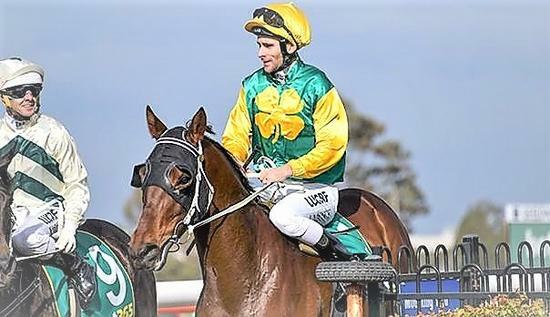 After an initial preparation that showed some promise he has developed and improved significantly this time around to confirm the good opinion the stable has of him and is starting to repay the faith of the owners. It looks like being onwards and upwards from here as he matures further and is extended out over a bit more ground.